As you’d expect, Mallorca’s east coast port/resort of Porto Cristo has plenty of eateries for holidaymakers as well as island residents. But if you’re happy to eat without a sea view, you’ll find an excellent restaurant tucked away in a back street. Or to be strictly accurate, two back streets, since Sa Sal has its front entrance on C/de la Tramuntana and its rear entrance (through the garden) on the neighbouring street. We went last night and parked right outside the restaurant. A warm welcome at Sa Sal. 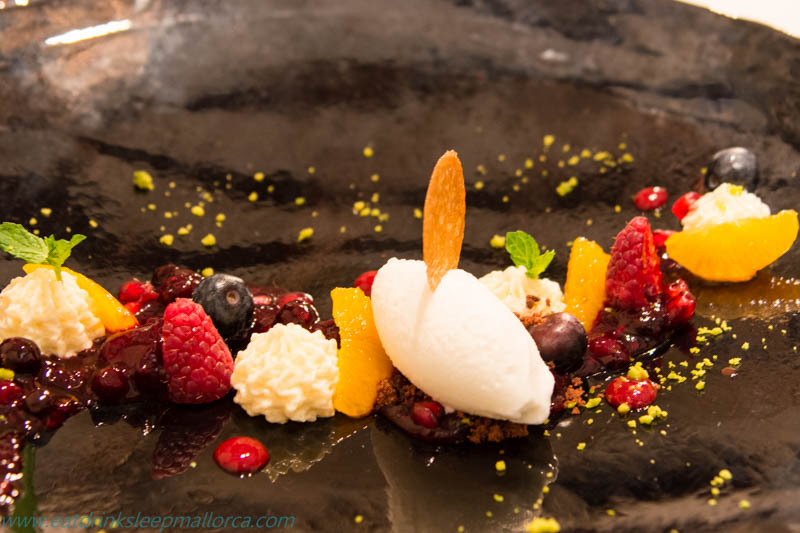 Chef/patron Mario Stephan Hekke originally had his restaurant Sa Sal in nearby Manacor, before moving it to this Porto Cristo townhouse setting – which has more character and a cosy romantic ambience. It has the bonus of a log-burning stove (used in cooler months), funky urban lighting over the tables, crisp white linen tablecloths and napkins, candles, and art and photos on the walls. There’s a garden for alfresco dining, but it’s not yet warm enough to have dinner outside so we’ll be going back in summer to see it. Dinner here is of the fine-dining variety, with a short but interesting à la carte and tasting menus. 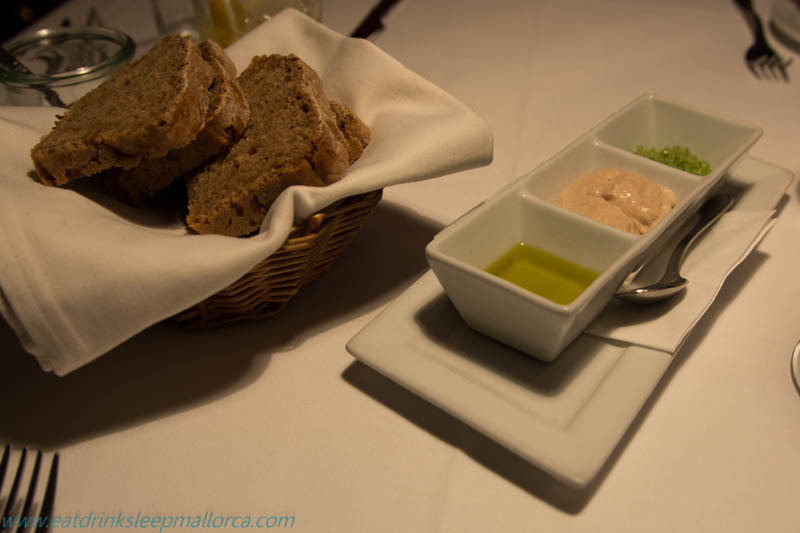 Dinner begins with a basket of very good home-made bread, olive oil, a home-made tuna dip, and a herb-infused local sea salt prepared on the premises. It’s a promising start. Home-made bread, dip, and herbed salt, and olive oil. An appetizer of watercress soup. 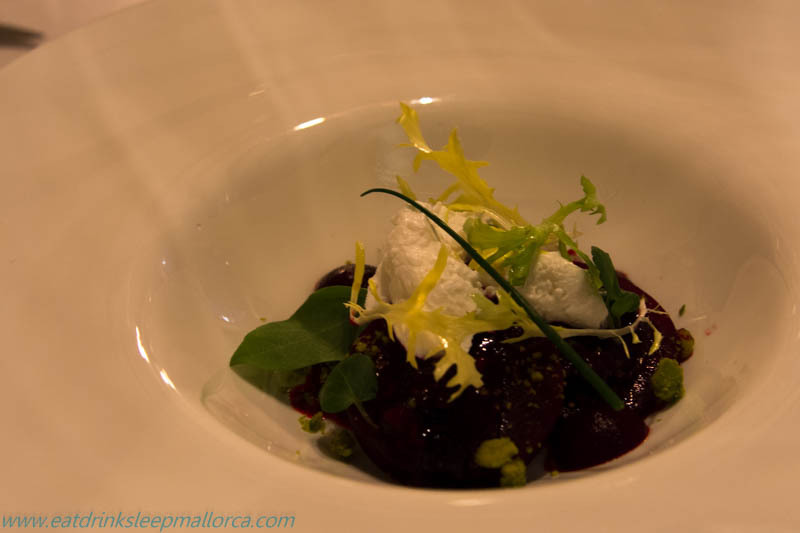 Beetroot salad with crumbled goat’s cheese, beetroot cream and balsamico. 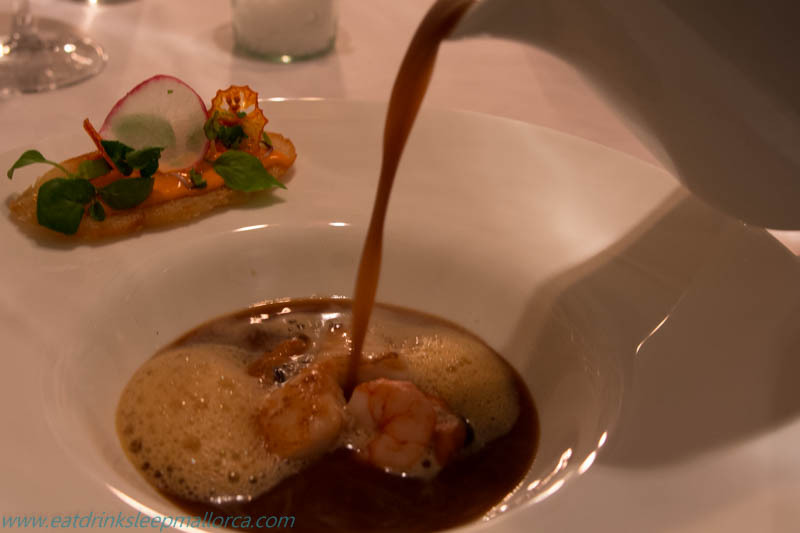 Bouillabaisse – delicious – accompanied by a small bruschetta. 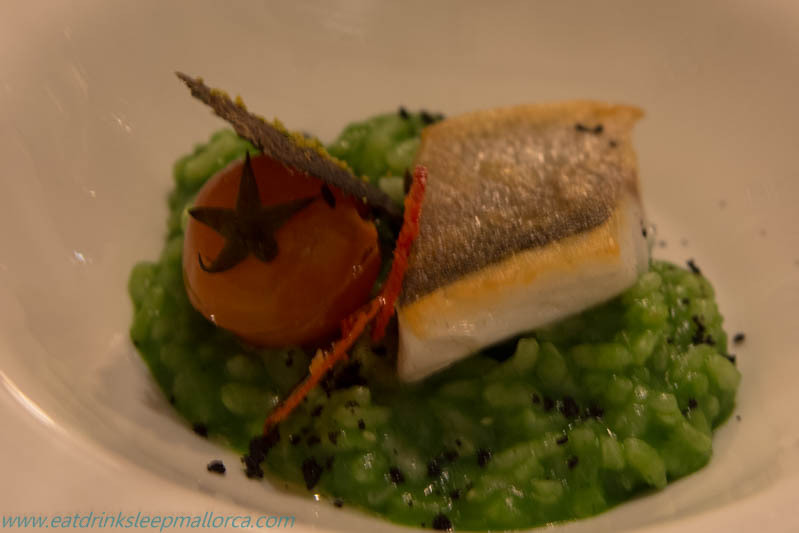 Risotto of wild garlic (seemingly known in Germany as wild boar garlic) topped with poached sea bass. 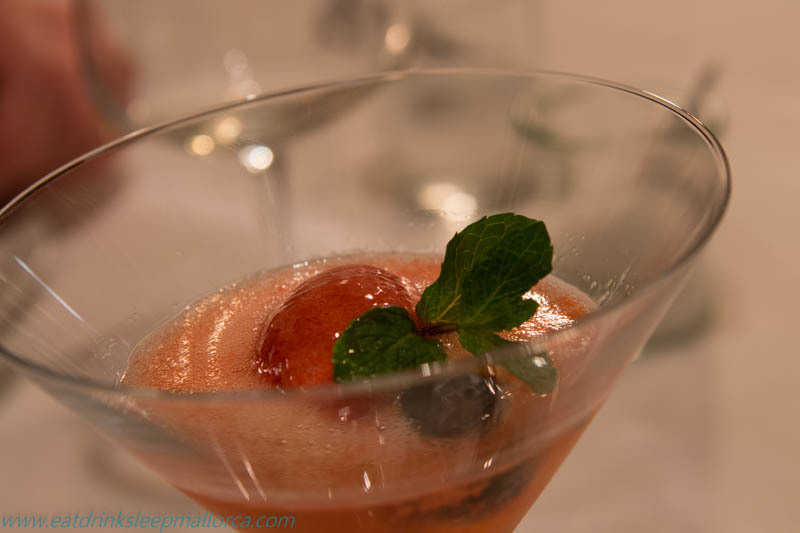 A strawberry sorbet with cava to cleanse the palate before the meat course. 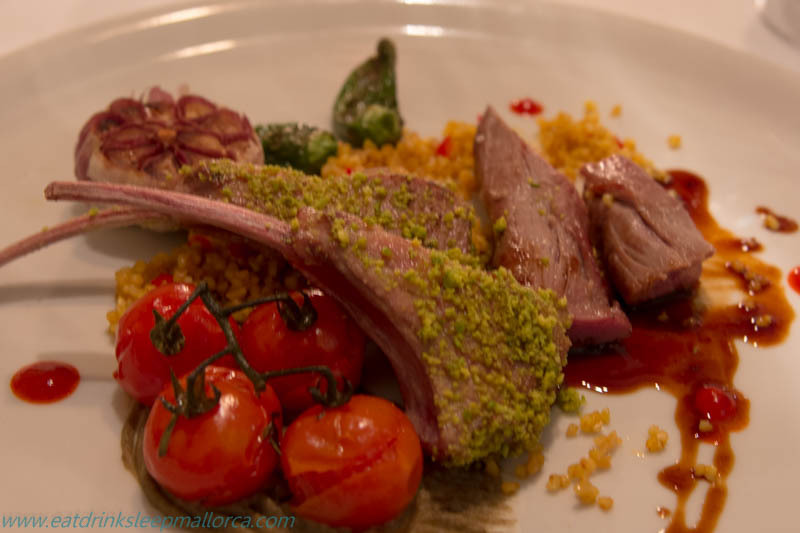 Perfectly cooked tender lamb cutlets and fillet from Navarra, Spain, served with bulgur wheat, aubergine cream, roasted garlic and baby vine tomatoes, and Padron peppers. The finale: fresh, fruity … and fab. 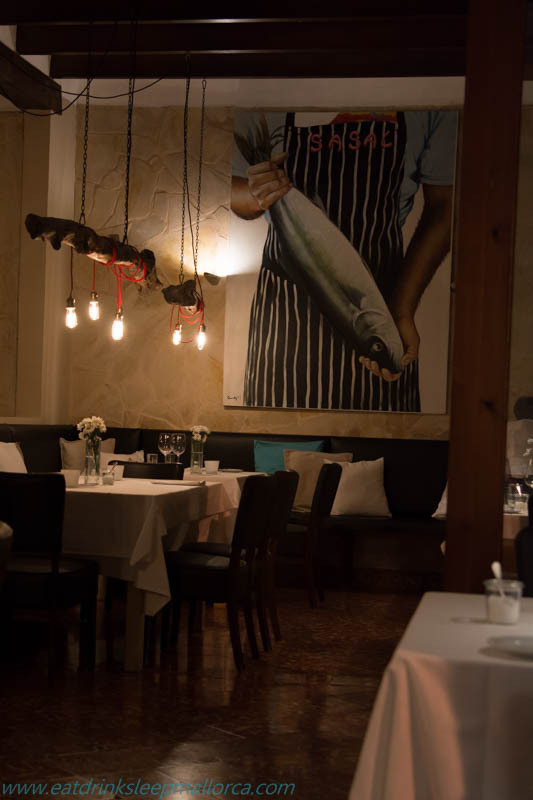 The colour of the white dishes and plates used at Sa Sal appears to have gained a rather rosy hue, thanks to the restaurant’s attractive lighting. Photos were taken as the dishes were presented at the table, and not in an area set up for photography. Carmen was our server, a friendly young German who told us she’d joined Sa Sal only at the start of this month. She’s obviously settled in well and seems to be a real asset for the restaurant. Other serving staff will join as the area becomes busier with visitors. We didn’t even look at the wine list, because we accepted Mario’s recommendation of a German wine that had arrived in a consignment just yesterday. As we almost exclusively drink Mallorcan wines these days, we opted for a change and enjoyed a VDP Kruger Rumpf Weisser Burgunder 2015 (Pinot Blanc). Mario has a great interest in wines and he told us that his list includes carefully chosen wines from around the world. He’ll be happy to suggest something to suit your palate if you can’t decide which to choose. Because this restaurant is German-owned-and-run, the diners mainly seemed to be German – probably because we’re still off-season and there are quite a few Germans living in the area. 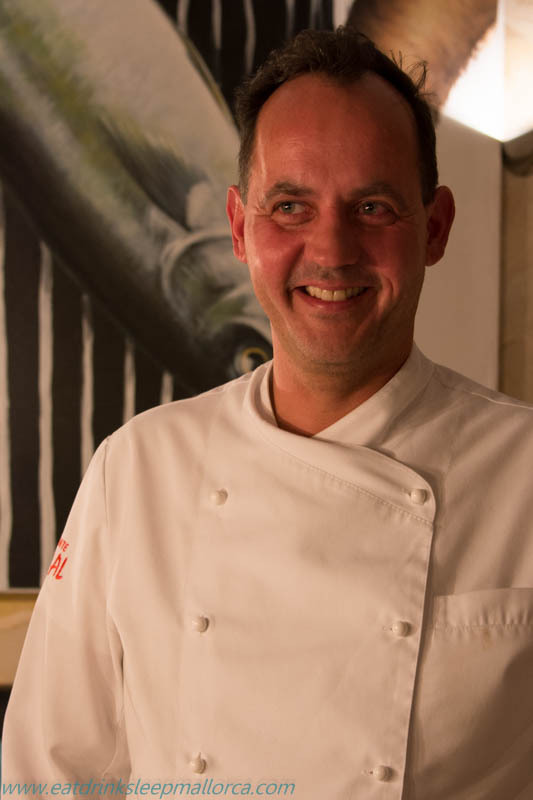 But we received a warm welcome and, if you don’t speak German or Spanish, the menu is available in English and the front-of-house staff all speak it too. Sa Sal is open for dinner only, daily except Mondays. 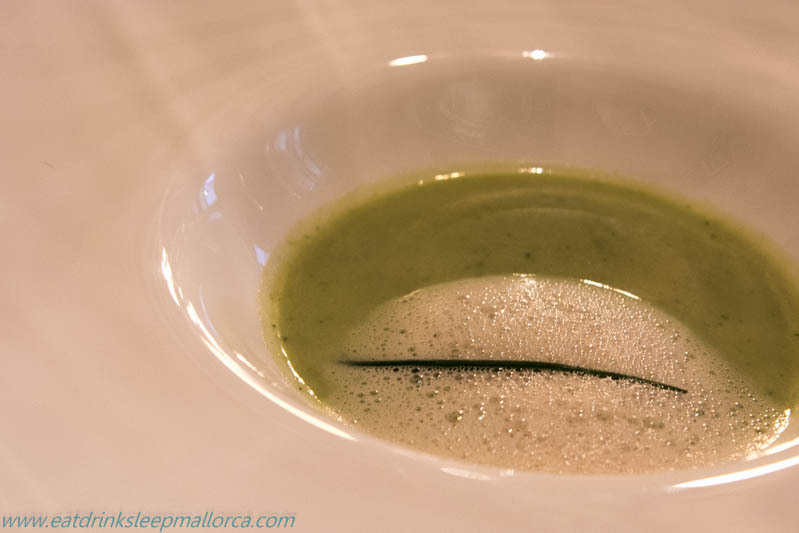 For the record, quite a few restaurants in and around Manacor close on Mondays as they’re usually rammed with clients on Sundays and staff need a day off to recover. 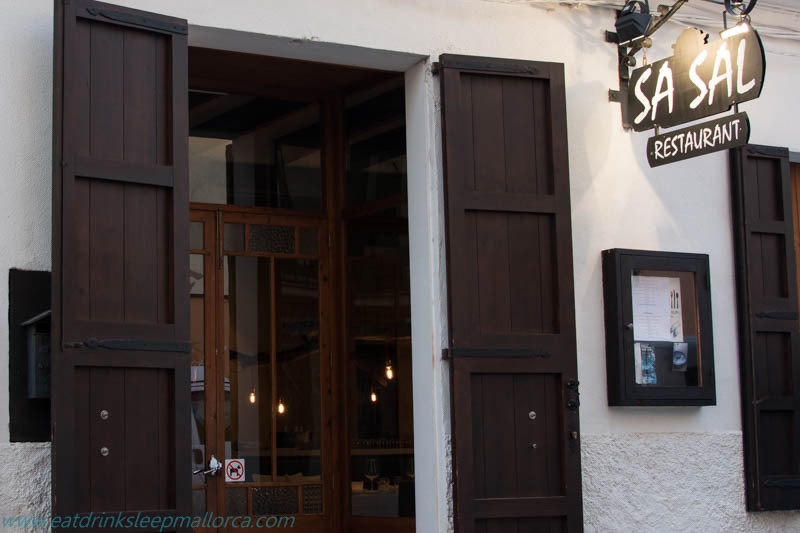 If you’re arriving in Porto Cristo from the Manacor direction, you’ll see a sign for Sa Sal in a street on the left-hand side off the main one-way road down to the seafront. This sign is on the garden entrance street, which has a no entry sign. Take the next street on the left and you’ll immediately see the restaurant sign. If you’re lucky, you’ll find free street parking here.